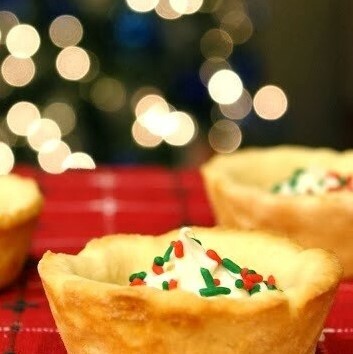 Have I got an easy and quick last-minute Christmas dessert for you! These sugar cookie tartelettes are so cute and festive, and they're a great option if you aren't quite so skilled at decorating traditional sugar cookies. I have to say since I first featured them on my Christmas blog, I've seen them pop up here and there, but make no mistake, mine are the original. I was inspired to make these when I ended up with leftover sugar cookie dough. I rolled out the extra and cut out large circles with a mug, then pushed them down into muffin tins. Be sure to bake them just a tad longer than you would regular sugar cookies to make sure the outside is hard enough that they won't collapse when you take them out of the pan. The best part about this last-minute Christmas dessert is you can simply buy premade refrigerated sugar cookie dough and roll it out. You can even make these up to a week in advance (stored in an airtight container) and fill them the day of your party for a very last-minute Christmas dessert. I took a major shortcut by using icing in a squeeze can before topping them with sprinkles; the idea behind these is they are a last-minute Christmas dessert. They're also easy enough for children to make. If you have a lot of kids coming to your house for a holiday party, you could even set these out unfilled with an assortment of spray icings or icing in piping bags, candy sprinkles and other toppings like nuts or crushed candy canes. They'll have a blast! If you want to make these sugar cookie tartelettes from scratch, here is a great sugar cookie recipe and a recipe for decorator frosting that is perfect for cookies.